Forty years ago Mexico City hosted the Summer Olympics--Mexico 68. And just as violence and concerns over China's human right's record are being protested and examined before the Beijing Summer Olympics in August, Mexico, too, faced scrutiny after one of the worst tragedies in its modern history. Ten days before the 1968 Summer Olympics the Mexican army and police massacred an estimated 300 student protesters gathered in Mexico City's Plaza de Las Tres Culturas or Tlatelolco. The student movement in Mexico City rose out of the constant injustices in the university system as well as politically around the country. But in an effort to silence the students before the world came for the Olympics, Mexico's PRI President Diaz Ordaz ordered the military and police to end a gathering at the plaza on October 2. Panicked by the intense gunfire, students and supporters ran to save their lives and created a chaos. Most of the media reports were controlled by the government and accused the students of firing shots first. It wasn't until years later that the surviving students were able to tell the disturbing truth about the Tlatelolco massacre. Mexico faced some world scrutiny, but overrall the downplaying of the events by the media worked and Mexico 68 continued as planned. 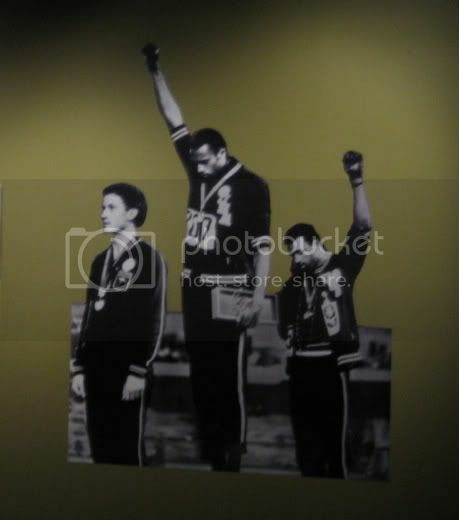 The only sign of defiance was when African-American athletes who received medals, rose their fists in the air with black gloves symbolizing Black Power. No one to date has been held accountable for the deaths of hundreds of Mexican students. While on a visit to the Plaza de Las Tres Culturas and the Memorial 68 museum, we couldn't help but feel the eeriness of the location. The reason the plaza is called three cultures is because, if you notice in the above photo, all the buildings represent the three cultures that make the Mexico of today. 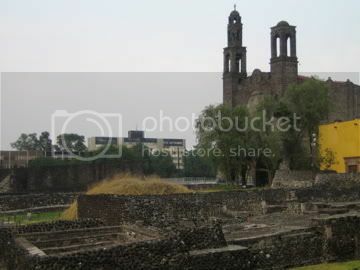 The pyramids and ancient ruins were built by the Aztecs, while the colonial-style church was built by the Spaniards and the urban apartment buildings in the background were built by the mestizos (or the Spaniard/Indigenous combo that are now modern Mexicans).